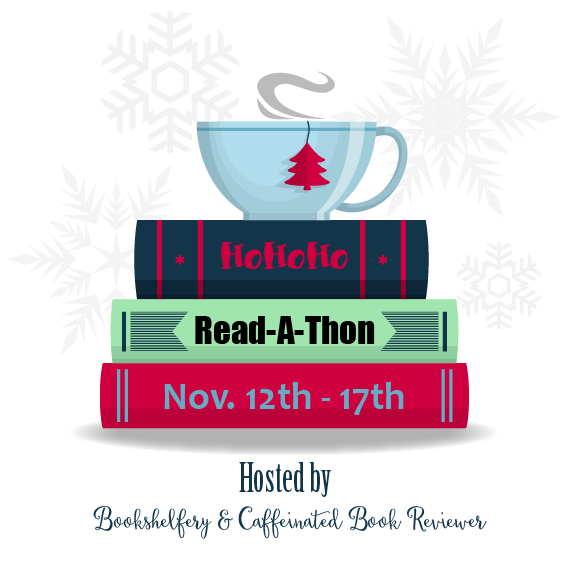 Laurie Here - Contemporary Fiction and MORE - Book Reviews: The #HOHOHORAT (Read-A-Thon) is HERE NOW!! Nov 12th to Nov 17, 2015 at midnight!!! The #HOHOHORAT (Read-A-Thon) is HERE NOW!! Nov 12th to Nov 17, 2015 at midnight!!! Yes! The hashtag #HOHOHORAT is important! You want to think of that while looking for us on Twitter or on Facebook, too! It's HERE! The HOHOHO Read-A-Thon!!! This is where we read CHRISTMAS BOOKS!!! ONLY CHRISTMAS!!! Grab your favorites, or those NEW ones that were just released, or the ones you have bought from previous years, and get ready to READ!!!!!!!!!!!! This is hosted by Bookshelfery and Caffeinated Book Reviewer! And if YOU decide to do this, which you CAN do, you are going to go to one of those blogs to sign up for this! This is soooooo much FUN!!!!!!! REMEMBER: “YOU” CAN DO THIS, TOO! For our non-blogger friends (meaning those of you who don’t have a blog) YOU can join too! Just link your Goodreads, Tumblr or Facebook account. (NOT YOUR TWITTER ACCOUNT LIKE I TOLD YOU - SORRY!!! I was wrong!!!) It's Easy-peasy!!! I'm looking forward to spending time with you!!! If ANYONE has ANY questions, please leave a comment down below! I will answer them for you! If you don't feel like you can leave your question down below publicly, you can email me at: laurieisreading at g mail dot com - messed up that way so those nasty robots don't find that!! LOL!!! Anyway, here is what YOU can follow EASILY! The rest of the RULES are for ME! LOL! Ho-Ho-Ho Readathon kicks off Thursday November 12th and ends at 11:59 pm on Tuesday November 17th. Challenges open 9am(EST) on the 12th and will remain open until end of thon. Twitter Party - Tuesday November 17, 2015 at 7 pm (EST)There will be prizes!! Use TweetChat to participate as it makes following easier. THE BUTTON CODE: WOOOOOOO!!! THIS IS THE FIRST TIME IT EVER WORKED!!! I COPIED AND PASTED IT, THAT IS IT!!! This coding will product the above button from the top! NOPE! IT DID NOT WORK!!! JUST COPY AND PASTE THE BUTTON! THAT WORKS!!! MY RULES so I can see them RIGHT HERE!!! LOL!!! Before or on November 12th, post a goals post to your blog. (if you do not have a blog post to another social media site such as Goodreads, Tumblr, Facebook, Google+ etc ) Be sure and link back to Caffeinated Book Reviewer and BookShelfery. It might be a good idea to friend, like or follow Kimba & I on whatever social media site you use so we can see your progress. Just mention Ho-Ho-Ho so we follow you back! Grab the button and share ! Twitter Party! Tuesday November 17, 2015 at 7 pm (EST) Come chat about the books you have read. There will be prizes. Grand Prize Raffle will be open until November 18th at 11:59 pm (EST) to allow you to submit entries. All winners of challenges and grand prize will be notified by November 20th. Each day we have a Challenge we CAN do, but it is NOT REQUIRED!!! You do NOT have to do it! ONLY if you want to do it, then do it! They ARE FUN!!! I am definitely doing them! You'll LOVE them!!! Each morning go over to THE LISTED BLOG, and sometimes they need a little time to get their event posted, so go back if need be! Do what they tell you to do! They ARE FUN!!! AS FOR THE OTHER BLOGS THAT ARE PARTICIPATING - SCROLL UP ABOVE AND HOP ON OVER TO BOTTOM AND THERE YOU'LL SEE ALL THE OTHER BLOGS THAT ARE PARTICIPATING IN THIS, TOO!!! LOLOLOLOLOLOLOL!!!!!!!!!!!!!!! As SOON as I started reading that I was laughing out loud!!!! LOLOLOL!!!!!!!!! Me, too!!!!!! We can start in 2 hours and 20 minutes as of right now!!! I LOVE this Read-A-Thon!!! LOVE it!!! !